Although I have personalized this, I have give credit to Dan Rockwell for this post. Dan’s leadership blog sets a high standard for me, but it is very much what I would like my blog to be. You can find a link to his original post at the end of this post. This may not seem like very exciting advice, but when a leader with experience leading during difficult times gives advice, you should pay attention. There is great power in “Be yourself.” The song “I Am A Child of God” describes the core of my identity, both as an individual and as a leader. Everything else, I hope, builds on that. Dan Rockwell, in his Leadership Freak Blog, discussed being yourself. I have added my own thoughts to his. #1. “Be yourself,” is self-affirming nonsense unless you give yourself in service. Sammy Davis Jr. made, “I’ve Gotta be Me,” a hit song in 1968. If you embrace the message of this song, do it in service to others. And Frank Sinatra did it his way, which always seemed pretty selfish to me. I think Keb’ Mo’s message is better than Sammy’s. See “Everybody Be Yourself” from Sesame Street, or the original album version (sorry, no video). Everybody’s got a will, everybody’s got a way. Everybody got to listen to what everybody say. Everybody got a nighttime, everybody got a day. Everybody’s got to give a little love away. Everybody’s got to stand up if you’re gonna be free. Everybody got to know how to live in harmony. A life lived in service to itself is a colossal waste; a life given in service to others is a life well-lived. “I’m just being myself” is never a good excuse for poor behavior or failure to lead. #2. “Be yourself,” stabilizes your leadership in turbulent times. If you don’t know who you are, you end up tossed in the wind. You lose yourself to the expectations of others. Everyone’s advice seems good. Being yourself is making forward-facing choices that align with your aspirations, affirm your values and leverage your strengths. And in difficult times, you don’t have to try to remember who you said you were. #3. Don’t simply, “Be yourself.” Be your aspirational self. Leadership demands personal growth. A leader who is not growing cannot lead effectively. Aspiration adds dignity and direction to self-discovery. Get a picture of who you aspire to become and live up to your aspiration. Your aspirational story is important. Begin with formative aspects of your story. What stories do you frequently share about yourself? What do those stories say about you? How are you like your parents or relatives? How has adversity shaped you? Use your story as a beginning, not an end. And don’t be afraid to share your story. Tip: Include others in the process of self-discovery. What do others see in you? You never know yourself in isolation. What does Jim Parker’s advice – Be Yourself – mean to you? What prevents leaders from being themselves? This post originally appeared in The Military Leader. But as every leader knows, leadership is leadership, regardless of where one serves. Most of the posts are not military-specific. This post shares a truth that I have come to appreciate as I have served in various leadership positions, as well as in some high-level following positions, for example on councils and committees. This one is well worth sharing, so please enjoy, learn, and share the spotlight. Every leadership position comes with its own spotlight. As a leader, you’re the one on stage, you make the decisions, you take responsibility for consequences, everyone is watching and waiting for you to take action. The default expectation is that you will do it on your own and everyone else will follow. Would involving them undermine your authority? No. Would it reveal weakness? No. Would it take too much time? Not for most of the decisions you face. …make them feel valuable and regarded. …get their buy-in and gain a glimpse of how your impending decision might affect the team. …reveal their strengths and gaps, which you can note for later development. …infuse their input, making your decision stronger. …show them how to lead at the next level. The notion of the solitary, all-knowing leader is outdated at best. At worst, it is a weak response to the opportunity leaders have to improve the quality of their decisions and develop the team. If leaders can move past the notion that they are the only ones on the stage, the performance will be much better. We can all benefit by sharing the spotlight. It has been too long since I have posted here. My muse has been in absentia, I’m afraid. Dan Rockwell is a prolific blogger with wonderful insights. This post resonated with me in several contexts, based on some of the hats I wear. 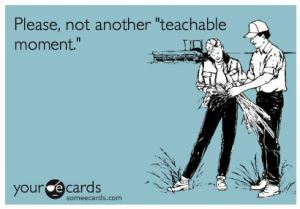 It reminded me of the proper attitude I should have toward my students, even the struggling, challenging ones. As a member of my church’s high council, we are increasing our emphasis on ministering and service. This made Dan’s insights doubly important to me, so I am reposting his post. You may read the original post here. Leaders get frustrated with the people they serve. You hear them grumble, “What’s wrong with people?” It happens in the business world, education, church world, and governments as well. Dissatisfaction – apart from loving action – eventually morphs into hate. Minimizing or ignoring your impact on others. Peevishness that won’t let go of small issues, faults, or offenses. Withholding help when you’re able to make work easier for others. Criticism that points to wrong without working to make something right. Complaining that camps in the past. Dispassion for the interest of others. Self-interest apart from other-interest is hateful. Unwillingness to adapt to others. You’re a hater if everyone adapts to you. Smugness when colleagues struggle, fail, or lose reputation. Temper outbursts and irritability. An irritable leader is a hateful leader. You might be thinking you don’t hate. You DISLIKE. Haters protect themselves by defining hate in terms of others. The hateful leadership list is my take on the opposite of love. I thought about love and wrote about the opposite. Maybe you prefer to use UNLOVING instead of hate. Does that sting less? Stop trying to control people. Focus on things within your control. Let go of everything else. Helplessness turns to hate. Expect to pour into others. Acknowledge that people ARE frail. Hate grows when you forget frailties, both your own and others’. Show up to serve for the joy of serving. Determine to spend most of your think-time focused on strengths, talent, opportunities, and the future. If you think focusing on failure and problems will take you where you want to go, you’re a hater. Celebrate imperfect progress. You’re a hater if nothing is ever good enough. Every morning start fresh with people, but don’t expect them to perform out of weakness. What does leadership that seeks the best interest of others look like? Dan’s question begs careful consideration. You will have to answer this for yourself. I will have to answer this for myself. Take It to the Limit? How fast can a person ride on a bicycle? How fast have you gone on a bicycle? I know I’ve broken 50mph (downhill, of course). In September 2016, Denise Mueller set a new women’s bicycle speed record, 147mph. And she felt that if she had a course two miles longer, she could have beaten the men’s record. Was your top estimate anywhere close to that? I haven’t even gone that fast in a car! Denise did not place any artificial limits on her potential as she trained. She had realistic goals, proper equipment, and a team that supported her. At the same time, there were certainly risks involved. We can probably draw some leadership lessons from the lead car. I’ll save those for another post. As leaders, we continually set goals for ourselves and for our teams. Our chief aim is continued improvement: we want our performance to become better over time. But are we ever guilty of aiming too low, and holding our team back? We know that greater expectations lead to improved performance. But have you ever had a leader who tried to limit your expectations? It can be a frustrating experience. 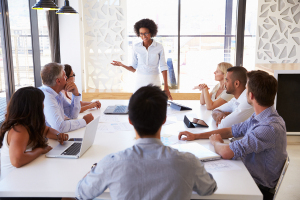 Yes, as leaders, we must help our teams set realistic goals; but this doesn’t mean that we should place artificial limits on our talented team members. We may have some record-breaking talent, but if we restrain them, they will never have a chance to break records. Mark Sanborn discusses that the human tendency is to limit our disappointments by limiting our expectations. If we expect too much, we will frequently become disappointed. But disappointment rarely follows low expectations. Sanborn says: “One of the keys to continual improvement is the willingness to risk disappointment, to see disappointment not as a bad thing to be avoided but as proof positive we are aiming higher and striving to get better.” He concludes that highly successful people are more often disappointed than are other people. Why are they successful? They don’t let their disappointments slow them down, or hold them back. As leaders, we should feel empowered to help our teams become better than their best. We must remember that this improvement is incremental. Elite Olympians don’t double their performance overnight. Frequently their coached improvements come as tenths of seconds are shaved off from their best times. What are the best metrics for evaluating your team’s performance? Hint: it is rarely money. What degree of improvement is appropriate for the tasks performed by your team? Remember the Olympians: the increments should be appropriate for the task and the team. What type of motivation is most appropriate for your team, including rewards for achieving the objectives? Sometimes a simple “thank you” is sufficient; other times it will be grossly inadequate. On the other hand, if you feel you must hover over your team and crack a whip over them, you will need to examine your “motivational” techniques. What is an appropriate time frame? It is important to balance the potential for disappointment with the potential for growth, and create a realistic time frame. Are you risking your own job by risking disappointment? This is a difficult situation for a leader: you may need to temper your risks, but don’t eliminate them. How do you imagine yourself becoming better than you already are? How do you overcome the limitation of your experiences? You cannot help your team grow if you are not growing yourself. Coach Lou Holtz is fond of saying “You are either growing or you are dying.” Choose growth. A good leader enables his team to become better than their best by setting them up to excel. For details on how she did it, follow this link: http://www.velonews.com/2016/09/news/ca-woman-rides-her-bicycle-147-mph-a-new-world-record_420507#2gpxGMoWiLSm285y.99. Sanborn, M. The Potential Principle, p. 9. 2017. Have You Lost Your Leadership Jingle? This morning, I heard an old Christmas song playing a store: Bobby Vinton singing “The Bell That Couldn’t Jingle.” His recording was released in 1964, but it was written by Burt Bacharach in 1957. This is a corny Christmas song with a moral, which was a popular genre in the 50’s and 60’s. It is in the musical style of the song factory writers of that era. But today, a line at the end of the first verse caught my attention: “The bell that couldn’t jingle: it had nothing there inside.” It’s an interesting thought. Most bells have a clapper or a ball to create noise. The poor bell in the song had nothing inside. How are you jingling as a leader? Is there something there inside? You may have noticed that at times there truly is “nothing left inside.” Can you recognize when that happens? How can you regain your lost jingle? In the song, Santa has Jack Frost freeze the little bell’s teardrop and put it in the bell so that our hero could jingle happily on Santa’s sleigh. Reevaluate and update your goals. If your goals are dated or unrealistic, they can cause you to lose your jingle. Current, relevant goals that are meaningful to you can help bring back some of your jingle. Reevaluate your motivations in life. This ties in with looking at your goals. Why do you do what do? Is it enough to ring your bells? Seek feedback from trusted colleagues or a supervisor. Sometimes a second or even a third pair of eyes can help you find out why your bells aren’t jingling. Sometimes your spouse or significant other can chime in and help. Take time to recharge. Everyone needs a break to regain perspective. Whether you are in search of your lost shaker of salt or your jingle, you won’t find it if your nose is always to the grindstone. More cowbell. Just kidding. Or maybe not. Sometimes your bell has to be struck from the outside. There are days when we need external help to make our noise. If you recognize that your jingle isn’t jingling, take the necessary steps to get your jingle back. Don’t be a ding-a-ling about it. A good leader can jingle all the way. Other recordings include Bobby Helms (1965), Burt Bacharach himself (1967? ), and Herb Alpert (1968). Vinton’s was the B-side of Jingle Bell Rock. I have nothing against Bacharach. His songs are timeless, and he was a good composer with a distinctive sound. But his was among the music that our parents listened to in the 60’s. Need I say more? I am not referring to the times when the jingling gets annoying. See, I did say it was corny. And because I live in Southern California, that bell would lose its jingle again when Santa gets here. Some great thoughts on leadership as a parent, a coach, and as a professional! I hear a lot of stories in my office that typically leave me shaking my head in disbelief. One such story took place this morning while two guys were discussing why their daughters decided to quit playing sports. What left me shaking my head wasn’t that they quit, it was when I heard these two fathers express their views about their daughters. For some reason the “two most pathetic dad’s in the world” condoned the actions of their daughters and praised them for standing up for their right to play. I love the concept of servant leadership. I believe that this is applicable in any leadership situation. I have even seen military leadership blogs that have discussed its importance in leading the troops. Blanchard has made this a focus of many recent posts, and this one really resonated with me. Especially the question about recalibrating oneself. The original post can be read here. I want to share a method for getting your ego out of the way and clear your path to becoming a servant leader. There are two sides of the human ego that can cause trouble. One is false pride—when you think more of yourself than you should. When this occurs, you spend most of your time looking for ways to promote yourself. The other is fear—when you think less of yourself than you should. In this case, you spend time constantly trying to protect yourself. In the seemingly endless Presidential campaign in the U.S., we are surrounded by chronic complainers. Countless friends complain about the choices (or the lack thereof) available to us. Venom and bile are flowing thick and fast. People become hateful and more and more angry. But the one constant I have noted, regardless of party affiliation, is that among all the complainers, no one is offering any solutions. The ceaseless yammering is not accomplishing anything, except for fomenting more anger. Not a very productive activity. 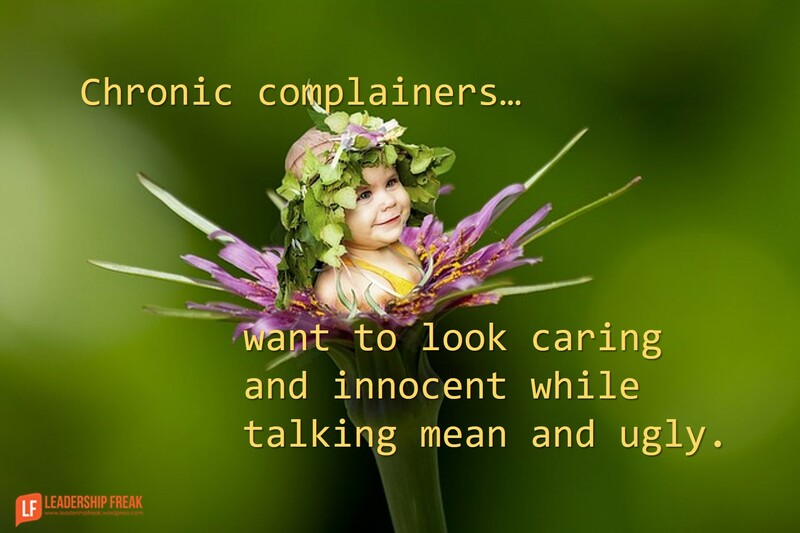 Do you know a chronic complainer? Do you have to work with one? Are you responsible for one? No one likes being around complainers; we all become uncomfortable when we have to listen to too many complaints. How you deal with this as a leader? Dan Rockwell shared some ideas. This is a repost of his blog post on Leadership Freak. The “make it go away” fairy doesn’t exist. Ignored complaints fester. Uncover the real dissatisfaction before solving complaints. “You should have ….” You caused the problem because you dropped the ball. “What are you going to do about this?” Whiners want – no expect – you to make it better. “I’m not happy.” Chronic complainers don’t own the real issue. They want something for themselves. “I want to look good while I talk bad.” Complainers use compassion as camouflage. They’re complaining because they “care”. What outcome would you like from this conversation? Don’t have conversations when intentions are undeclared, obscure, or unknown. If they don’t know what they want, have them come back when they do. Are you looking for a solution or time to vent? (Ask this when you know and trust each other.) Some issues are solved with an ear. Second venting sessions are complaints. It’s time to design solutions. What should have happened to prevent this problem? What could you have done to prevent this problem? What could I have done to prevent this problem? #2. What would you like me to do about this? Asking doesn’t mean you’re going to do it. It’s the beginning of a conversation about real solutions. An alternative: What would you like me to do for you? #3. What needs to happen for you to feel good, when our conversation is over in twenty minutes? #4. If you don’t mind me asking, “What makes you care about this?” Explore assumptions and values. Nagging issues intensify with time. What hidden agendas might complainers have? How might leaders deal with underlying issues? The original post may be viewed here.